A good stethoscope is an essential tool for many healthcare professionals today. But with so many different brands today, it may be a little difficult for you to decide which is appropriate for you. So, we have written this guide to help you identify the best stethoscope for you. This isn’t just some guesswork, we checked through many different brands and types to curate this list. Whether you’re a doctor, nurse, EMT or medical student, you should be able to make an informed choice on which device is best for you. We’ll start off by listing the best and their remarkable features, we would dive in deeper into each product’s review a bit later. Tip: We notice a lot of people are concerned about the color of their stethoscopes, the good news is that most of the brands listed here come in many colors, so you should focus on their features instead. Before we go on into the details of each of these stethoscopes, if you are a nurse or doctor, you can jump to our special sections by clicking any of the links below. Now let’s get to the details of each stethoscope and why they have been included in our list. This is by far the best right now. If you work at a hospital, you’d have probably seen it being used by some of your colleagues. It is an extremely popular device worldwide and is known for its sensitivity, durability and easy maintenance. Even though it isn’t the cheapest in the market today, it is good value for your money. If you are someone who is very focused on your clinical work and want a stethoscope that will last you a really long time, you should get this. To be honest, if you’re a medical student, you can use it through medical school and it will still work very well 5 years into your practice as a doctor without you needing to change any of its parts. It’s that durable. One other advantage of this product is that it has a two-sided chest piece that can be used for adults and children. Tunable diaphragm technology. You can hear different frequency sounds by changing the pressure you exert on the chest piece. Not easily stained and easy to clean. Not damaged by skin oils and alcohol. Long lasting. Usually has a 5-year warranty. If there’s anything that stands out about this one, it will be its affordability. If you need a device that can take care of basics while not costing you a lot, this is a good fit for you, it only costs a few bucks. It is recommended for people who just want minimum features in a stethoscope. Despite its affordable price, it has a dual head for use in both adults and children, it has a no-chill diaphragm (it doesn’t feel cold when placed on a patient’s skin), and a comfortable earpiece. Another reason to love this product is that it comes with a spare diaphragm and extra pairs of ear tips, just in case you get yours damaged. Here are its pros and cons. Does not ship to countries outside the United States. This device is all about sensitivity, clarity, and durability. If you aren’t bothered about cost but want a very high quality, long-lasting and clear piece of equipment, you should get this one. It is the best choice for cardiologists. It has perhaps the best acoustic performance available, has a double-lumen tube (it is remarkably more comfortable on your neck than most of its rivals) and can be used for both adult and pediatric patients easily. You could easily discard your current one and opt for this if you tested it once, there is very little background noise. It has a tunable diaphragm which you can use to listen to both high and low frequency sounds clearly. All you’ll need to do is adjust the amount of pressure you exert on the chest piece. As its name implies, this product is known for one thing: it’s lightweight. At just 100g, it’s about 50% lighter than popular Littmann products, making it the best for those who care about equipment weight. This means it’s very easy to carry around and you can easily keep it around your neck for a long period without feeling uncomfortable. It has a dual head, usable in both pediatric and adult patients. It’s not the most sensitive listening device, meaning you may not be able to listen to all those ‘hard to hear’ heart murmurs, but it is sure useful at the basic level. You may not want to use this if you’re a cardiology resident doctor. One more thing you should know about this product is that it is very affordable. This is by far the most versatile stethoscope. I honestly doubt if there’s any other digital stethoscope available today with more positive reviews. The good thing about this stethoscope is that it is ‘two’ in ‘one. What do I mean? It actually can function both as an analog device and as a digital one. The Eko core is the digital component that attaches to the tube of the Eko cardiology analog stethoscope, amplifying its sounds for a more audible experience. Also, if you are happy with your current analog stethoscope and don’t want to ditch it entirely, you can purchase the Eko core, it will transform your analog device to a digital one in an instant. Very impressive. This unique capability makes it the right device for a clinician who has to deal with pediatric patients. Most other brands aren’t pediatric-friendly, they have adult-only chest pieces. But this one is different, you can use the smaller diaphragm to auscultate children, and use the wider diaphragm in adults. Its digital capabilities also help you record sounds for replay later or transmit it to your phone or another device via Bluetooth. It also has a dedicated app for iOS and Android smartphones and tablet that you can visualize and save all your data, it also works in sync with your electronic health records to paint a good picture of your patient’s well-being. The also has a fairly good battery that can last up to 9 hours on a full charge, its battery is chargeable via a USB cable. This device will take a couple of hundred bucks from you but is worth every dollar you spend on it. It provides excellent value for your money. Well, it lacks a screen, perhaps to make it very portable and less cumbersome. But a screen won’t be a bad idea at all. It also has just a one-year warranty. This relatively short when compared to the warranty periods of other premium stethoscope brands. One of the only digital stethoscopes that can be used for children. 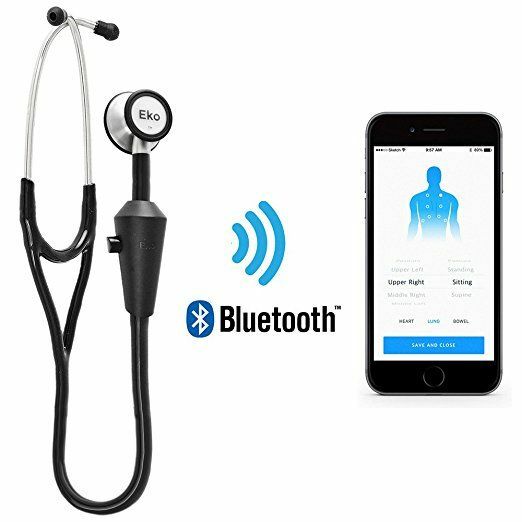 When looking for the most ideal stethoscope for you, you should consider a fully functional, sensitive and durable one that can help you in clinical activities like blood pressure checks, listening for heart sounds and lung auscultation. We understand that you don’t want a product that will last just three months or one that will produce muffled sounds or one that isn’t aesthetically pleasing. This is why we have spent several hours reviewing different brands and products, looking for features that would make auscultation a pleasant thing to look forward to. If you wondered what qualities we used to come up with this list, we examined things like personal experiences, general reviews, price, value for money, functionality, comfort, ease of use and of course sensitivity. This is perhaps the most important quality a good one should have. After all, the primary function of a stethoscope is to let you listen to sounds clearly and audibly. If you get one that has bad acoustics, the sounds will be muffled and you may not be able to identify the Korotkoff sounds easily when checking a patient’s blood pressure using a manual sphygmomanometer. Also, you may not be able to identify those all-important crepitations or rhonci when auscultating the chest, listening for lung sounds. This is why every good stethoscope must have a good acoustic performance. Chest-pieces come in two styles: The single head chest-piece and the dual head chest piece. This single head chest-piece is primarily only used for one category of patients, either adults or children. While the dual head has two different diaphragms for listening to the chest of both adults and children. You can decide to use either diaphragm by simply turning a valve near the tube. If you don’t do much chest auscultation in your field and only need one for checking blood pressure manually, a single chest piece would do the job. Also, if you’re a pediatrician or pediatric nurse or physician attending only to children or adults respectively, you may not need a dual chest-pieced product. However, if you’re a general practitioner, it may be more appropriate to buy a dual chest-pieced device so it will be easy for you to care for both children and adults with the same device. An ideal auscultation appliance should be comfortable to use. What does this mean? The ear tips shouldn’t be poking your ears too hard. These tips should be made of a very comfortable material that should soothe your ears, not poke them. I have personally used several products and I can tell you that uncomfortable earpieces can affect how well you use a stethoscope. If it pokes to hard, you may not be patient enough to wait for the sounds you should pick up. Imagine checking the blood pressure of a patient while having the earpiece persistently hurting your ears, you’ll not want to check it twice (as you should). An ideal device should have soft, acoustic and comfortable tips. Another comfort parameter to consider is the tube length, a very short tube would mean you have to bend over acutely to auscultate. This can be very uncomfortable or painful if you already have back pain. The best stethoscope should have an adequately long tube (with excellent acoustics), so you don’t have to bend over while listening to the chest of your patient. I don’t know who invented the practice of hanging these around the neck, but that practice has definitely gone viral. If you glance through the emergency department of many hospitals, you’ll definitely see some medics with their devices around their necks. Perhaps they do this not to misplace theirs or to have it handy when they need to assess a patient really quickly. This habit is one of many reasons why a stethoscope shouldn’t be too heavy, you should have one that will be easy to move around with without you being conscious that you are carrying anything. Except you plan to use yours very infrequently, durability matters. If using yours is part of your daily life as a health professional, you should get one that will last very long. These devices are arguably one of the most used pieces of equipment in hospitals and health facilities, and should not break down or look terrible after just a few months of use. How then do you identify a durable product? The secret is simple: look at the warranty you’re given. It should have a long warranty period. The manufacturer knows the parts won’t break off in a few weeks, and if this happens you can claim your warranty and get it replaced or change the faulty part for free. In reality, they have different durabilities, with Littmann leading the pack. The average Littmann product has a warranty period of about 2 years for the ‘low-end’ ones and 5-7 years for the ‘high-end’, specialist products. When purchasing yours, it important to buy one that is cost-effective, that is, at the right price for what you need it for. What do I mean? If you are an infrequent user and need it perhaps to place on your desk or in your car, you may not need to spend much. However, if you’re an emergency nurse, doctor or cardiologist, you’ll want to buy one that has very good acoustics and is easy to use for the right price. Now that we have discussed features to look for in the best stethoscope, let us drill down on an important question: How much do they cost? The prices vary based on the brand, quality, and specifications. They range from about $15 to $400. The cheapest ones have very basic features, with not much technology or durable parts, while the high-end ones have some advanced features and solid long-lasting parts. For instance, electronic types are more expensive than traditional ones for obvious reasons. Many of them have digital screens, advanced acoustics, and even Bluetooth capabilities. If you’re a nurse, the best one we recommend you get is the MDF Acoustica. Because it has many features you’ll want in a listening device. It is easy to carry around, comes with an ID tag, has a dual head for attending to both adults and children, very affordable and comes in several colors. You can have a unique device that can perform its duties, yet pretty enough to match with whatever nurse uniform you have on. Its low price even means you can get more than one of different colors to help you stay stylish. If you’re a doctor or medical student, you should go for a very durable device that can serve you for years, and of course, comes with several years warranty. You should also select one that doesn’t compromise on acoustics, and can serve both pediatric and adult patients effectively. 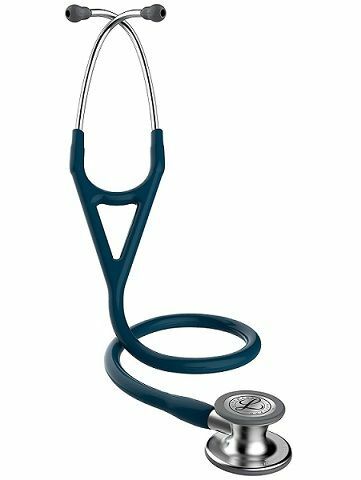 We definitely recommend the Littmann Classic III, it is clearly the best for doctors. It has a wonderful acoustic performance and lasts really long. It also comes with a 5-year warranty. There are many parts. It’s important to understand each of these parts so that you’ll know which part to request for when trying to get a replacement for a faulty part. Also, knowing the parts of your device will help you understand how they all function together to give you a good auscultation. Here’s a list of the parts, we’ll explain each one thereafter. These are the soft parts that go into both ears. As we stated earlier, they go a long way in determining how comfortable you will feel in general. The softer they are, the more comfortable you will feel. The ear tips are made of rubber or silicone and are firmly attached to the ear tubes. Low-quality products usually have their ear pieces fall off the ear tubes easily or are quickly broken down or torn. The good news though is that most come with extra ones, just in case yours falls off or rips apart. The extra tips usually come in different sizes. Generally, when buying a stethoscope, it is important to ensure the model you have chosen comes with extra ear tips because if the installed ones fall off, yours would be unusable till you get them replaced. The ear tubes are the metal parts that link the main tubing with the ear tips. Their function is to transmit sound to the ear tips. They are typically made of aluminum or steel and are ribbed at their end to ensure a tight fitting with the ear tips. Also, the ear tubes are angulated to fit the anatomical orientation of the ears, they bend forward and downward to make auscultation easy. The headset is simply comprised of the ear tubes, the ear tip, and the tension springs. If you wondered what the tension springs are, here’s a quick explanation. If you look at a picture of a stethoscope, the two ear tubes usually cross each other in an ‘X- shape’. This is the job of the tension springs, they ensure that the tips stay firmly in your ears when you auscultate by applying some tension across the ear tubes. If you pull the two ear tubes apart, you’ll notice they’ll give some resistance and then return to their normal ‘X-shape’. This happens because of the tension springs. The tubing is the flexible part, it helps to transmit sound from the chest piece to the ear tubes. Some devices have a single tube while others have double tubes. The double-tubed ones are supposed to have a better acoustic performance but that isn’t always the case. The presence of two tubes causes an additional unwanted sound caused by the rubbing together of the two tubes. An improvement in this design is to have two separate sound paths (double lumen) in a single tube as seen in Littmann cardiology series. The durability of the tube matters, some brands offer tubes that have some resistance to body oils and alcohol. This is important because they are everyday tools for some health workers, and it is often placed on different surfaces and parts of the body. The best stethoscope should have some resistance to many fluids and its surroundings. The chest piece is the part that collects the sound from the environment (the patient’s skin) and transmits it to the tube. It is made up of a stem, diaphragm and or bell. This metallic part that directly connects the tubing with other parts of the chest piece. In dual-head products, it has a switchable valve that makes you able to select which of the heads you want to listen to per time. The diaphragm is the round surface of the chest piece that directly picks up sounds and vibrations from the environment. They come in different materials. For example, Littmann models have a tunable diaphragm. What this means is that the more pressure you apply to the chest piece when auscultating, the higher the sound frequency you can hear and vice versa. Some have two diaphragms with the bell portion closed. This means that you can enjoy a better sound quality when trying to pick up lower frequencies with the smaller bell diaphragm. A practical example is when you want to listen to the chest of a child, you won’t need to look for another device, all you need to do is to switch the valve on the stem to open up the bell’s sound pathway. The bell is the smaller acoustic surface on dual-head devices. It is usually lined with a non-chill sleeve that can be replaced with a small diaphragm. It is better to use the bell when caring for thin patients or in pediatrics. When they were first invented, they looked a lot different from their modern counterparts. They were usually a hollow straight tube with a single earpiece and a single auscultation surface. A lot has changed today to make them carry out their function- to enhance body sounds and transmit them to the ears. The principle is pretty straightforward. The diaphragm picks up the sounds and vibrations from the patient’s skin and then transmits the sound through the chest piece stem, Sound then passes from the stem to the flexible tube, which forwards the sound to the ears via the two ear tubes and the ear tips. The listener then tries to understand the pattern of the sounds heard to determine what the inference is. They are used for several clinical activities like measuring blood pressure, listening to heart sounds, auscultating the lung fields and even listening for bowel sounds. These are skills that need to be learned and practiced in the clinic. As with any clinical skill, it takes time and continuous practice to master the use of yours for different procedures. As you keep using yours and learning how to distinguish different body sounds, you will eventually become a pro at handling this symbolic medical equipment. Your device should be wiped once obviously dirty with a damp cloth. You should also clean the diaphragm with cotton swabs dipped in alcohol, to help disinfect it, especially when you have multiple patients to attend to in a short period. Failure to do this can lead to an involuntary spread of infections especially those affecting the skin. Keep them away from extreme temperatures, solvents, and oils as these could damage the rubber tubing. Also, don’t subject them to any sterilization process or immerse it in any liquid as this can permanently damage them. The ear tips and diaphragms are detachable, so you could temporarily remove them to properly clean yours when necessary and replace them when done. Tip: Stethoscopes differ and so does their maintenance best practices. Always refer to your product instruction manual before using yours to see how to properly maintain yours. We have been able to discuss our 5 best stethoscopes and hopefully, you’ve been able to decide which one works for you. We are very open to updating this article as frequently as we can, so we will like to hear from you. Have you tried any of these yet? Kindly tell us your experience by using the comment section below. Also, If you feel there’s any product that deserves to be on this list, kindly drop a comment too.